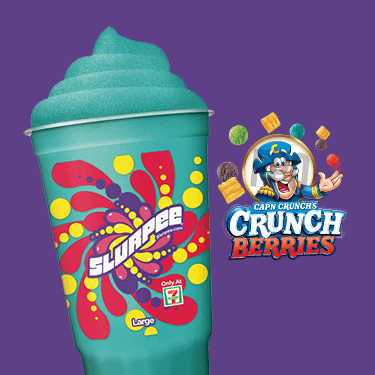 Free Slurpee day is coming! Tomorrow 7/11, enjoy a small slurpee for free at 7/11 stores from 11 a.m. to 7 p.m. while supplies last. You don’t need a coupon to pick up your freebie, but there might be a line to claim it. 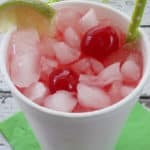 7/11 is celebrating 91 days is business and I love this free gift to US! 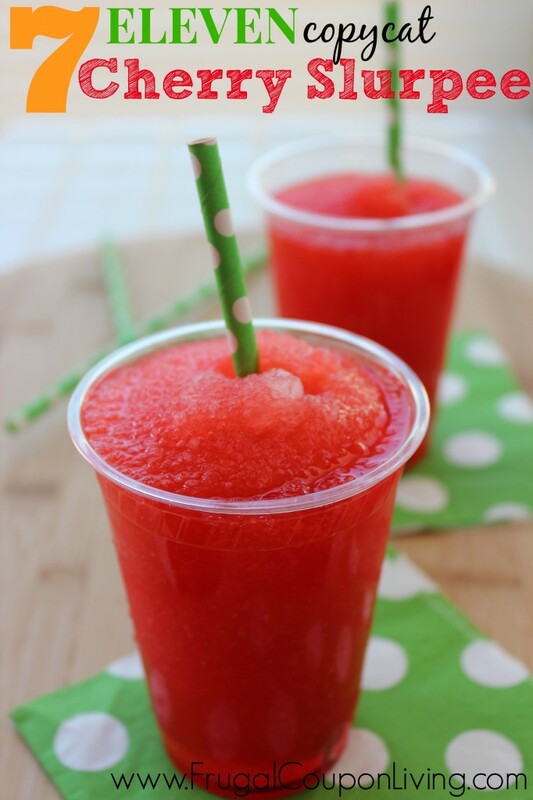 Don’t forget the Copycat Slurpee Recipe on Frugal Coupon Living. It’s Back – Cow Appreciation Day 2018 is Tuesday, July 1oth. Cow Appreciation Day is an annual event at Chick-Fil-A! 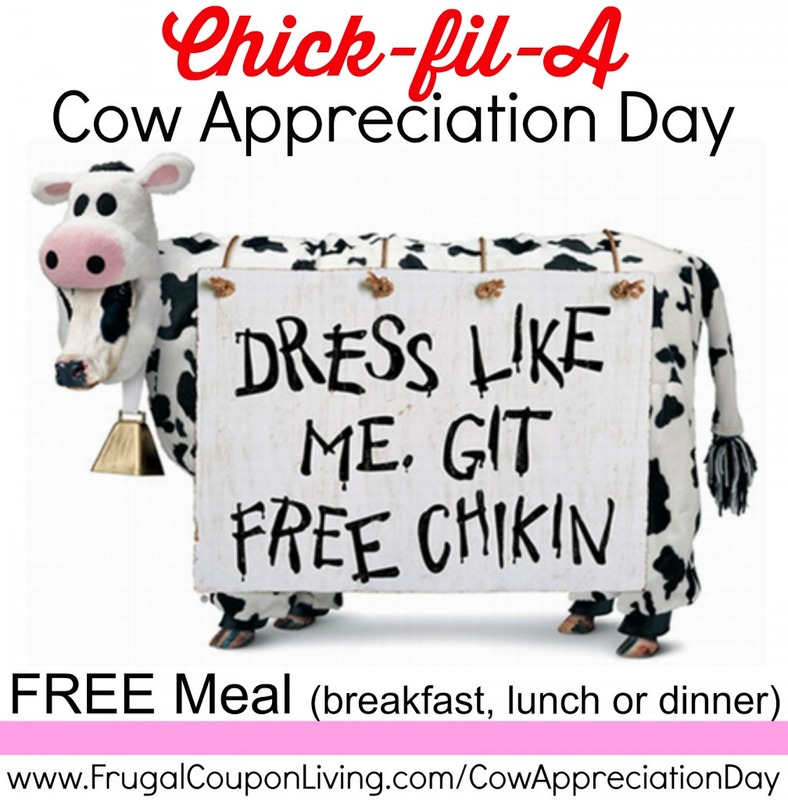 Dress like a cow on this, you get a FREE combo meal from Chick-fil-A during breakfast, lunch or dinner! A free entrée is awarded for partial cow attire. This deal goes on until 7 PM. 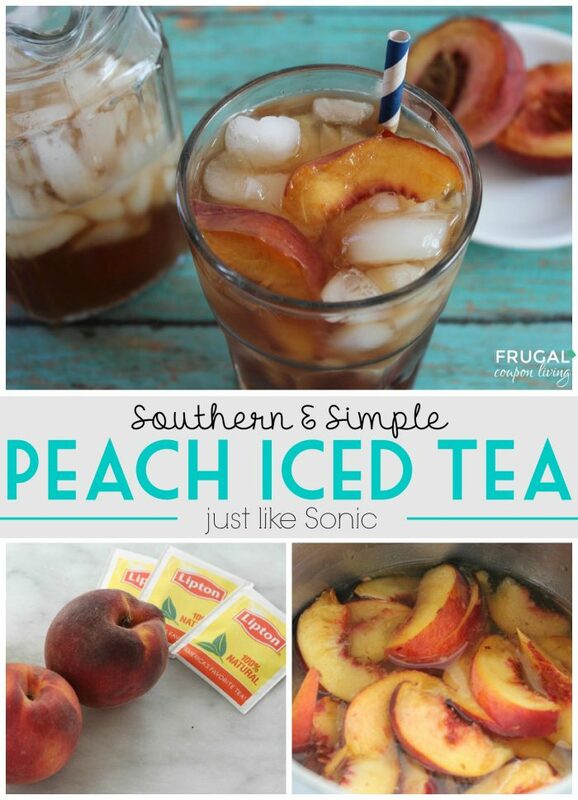 Find more Restaurant Deals and FREEBIES on Frugal Coupon Living. This is a national event, but as always, call your local location ahead. Tis the Season for Holiday Bonus Gift Card Offers! This time of year many Restaurants and Retailers will offer Bonus deals when you buy gift cards. Use the bonus for your self or pass it on as a gift too. Either way, now is the time to stock up. Most are available till the end of the year, unless otherwise noted. Be sure to PIN THIS POST so you can come back and check updated gift cards. I will add them as they come! Thanks to Mission to Save for compiling this list. Restaurant Bonus Gift Card Offers 2017! Applebee’s: receive a $10 bonus card when you buy $50 gift cards thru 1/7/18. Bonus card expires 3/4/18. Benihana: receive $10 bonus card when you buy $50 gift cards. Promotional cards are valid from 1/2/18 – 3/31/18. BJ’s Restaurants: receive a $10 bonus card when you buy $50 gift cards or $25 bonus with $100 purchase thru 12/25/17. Also receive a 20% off VIP card delivered via email. Bonus card and VIP card valid 12/26/16 – 2/13/18. Bonefish Grill: receive $10 bonus gift card when you buy $50 in gift cards. Boston Market: receive a $5 Bonus Card for every $25 in gift cards purchased thru 12/31/17 in-restaurant or online. Bonus Cards redeemable 11/24/17 – 1/31/2018. Bravo: receive $10 in bonus gift card with every $20 in gift cards. Bonus card redeemable 1/1-3/15/17. Brio: receive $25 in bonus gift card with every $100 in gift cards. California Pizza Kitchen: receive a $20 rewards card when you buy $100 worth of gift cards before 11/22/17. Chili’s: receive a $10 bonus card when you buy $50 worth of gift cards. Claim Jumper: receive a $10 bonus card when you purchase $50 in gift cards thru 12/24. Bonus card is valid 1/2/18 – 5/31/18. Denny’s: receive $50 in Denny’s coupon for every $25 Gift Card purchase. Promotion ends 12/24/17. Fogo de Chão Brazilian Steakhouse– receive a $25 Holiday Bonus Card for every $150 in gift card purchases. Available 10/31-12/31/17, Online or in Restaurants. Redeemable 1/2/18 – 3/30/18. Gift Cards may not be redeemed on the day of purchase. Landry’s Locations: receive a $10 bonus card when you purchase $50 in gift cards thru 12/24. Bonus card is valid 1/2/18 – 5/31/18. LongHorn Steakhouse: Receive $5 bonus gift cars when you buy $25 in gift cards online. Bonus card is valid 1/1/18 – 2/4/18. Montgomery Inn: receive a $20 bonus gift card when you buy $100 in gift cards. Bonus card valid 1/2/18 – 3/31/18. Morton’s: receive a $50 bonus card when you purchase $250 in gift cards thru 12/24. Bonus card is valid 1/2/18 – 5/31/18. Noodles & Company: receive a $5 bonus card for every $25 you buy in gift cards. Gift card promo valid 11/1/17 – 12/31/17. Bonus cards valid from 11/1/17 – 1/16/18. Olive Garden: Receive $10 off bonus coupon when you buy $50 in gift cards. Outback Steakhouse: receive $10 bonus gift card when you buy $50 in gift cards. Bonus card redeemable 1/1/18 – 2/11/18. P.F. Chang’s: receive a $20 bonus card for every $100 you spend on gift cards online. First Watch: receive $20 Bonus Bucks when you buy $100 in gift cards. Bonus Bucks valid 1/1/18 – 2/28/18. Red Robin: receive a $5 Bonus Buck Rewards card when you buy a $25, or $10 when you buy $50 gift card. Bonus bucks valid 1/1/18 – 2/28/18. Roy’s: receive $20 bonus gift card when you buy $100 in gift cards. Bonus card redeemable 1/1/18 – 2/11/18. 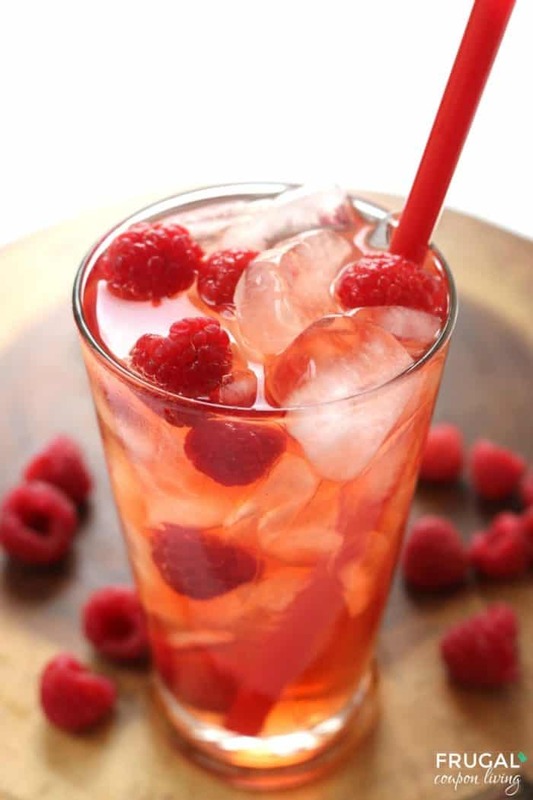 Ruby Tuesday: receive $15 bonus coupon when you buy $50 in Ruby Tuesday Gift Cards (plus free Shipping!). Free bonus coupons delivered via email and are valid from 1/2/18 – 3/6/18. Rusty Bucket : receive a $10 bonus card when you buy $50 gift card purchase. Bonus card valid 1/2/18 – 2/28/18. Ruth’s Chris: receive 10% Bonus Card when you buy $250 or more in gift cards. Holiday bonus cards valid 1/1 through 3/31/18. Steak ‘n Shake: receive a $5 Bonus certificate when you buy $20 in gift cards. Certificate valid 1/3/18 -2/28/18. TGI Friday’s: receive $5 – $25 bonus bites card and a FREE Redbox Movie when you purchase $25 in gift cards. Tony Roma’s: receive $15 in RomaBucks For every $50 in Tony Roma’s Gift Cards you purchase. RomaBucks are valid 1/1 – 3/22/18. Uno Chicago Grill: receive a $5 bonus voucher when you buy $25 in gift cards. Promotional Gift Card valid 1/2- 2/13/18. White Castle: receive $5 promo card when you buy $25 in gift cards, while supplies last. Promotional Gift Card valid 1/2- 2/28/18. Retail Gift Card Offers 2017! Barnes & Noble: Get a free $10 Reward,valid from 12/26/17 to 2/28/18, with any Gift Card purchase of $75+ or more. The Children’s Place: receive a $10 off coupon when you buy $40 in Gift Cards thru 12/24/17. DSW: receive a $5 bonus gift card and free box when you buy $50 in gift cards, or $20 when you spend $100. Bonus card is valid between 1/5/18 – 1/27/18. Marcus Theatres: Buy a $25 gift card and get $5 in snack cash AND $5 in rewards that will go directly on your Magical Movie Rewards card! This offer is available through 11/9/17. Like the 2017 Bonus Gift Card Offers? 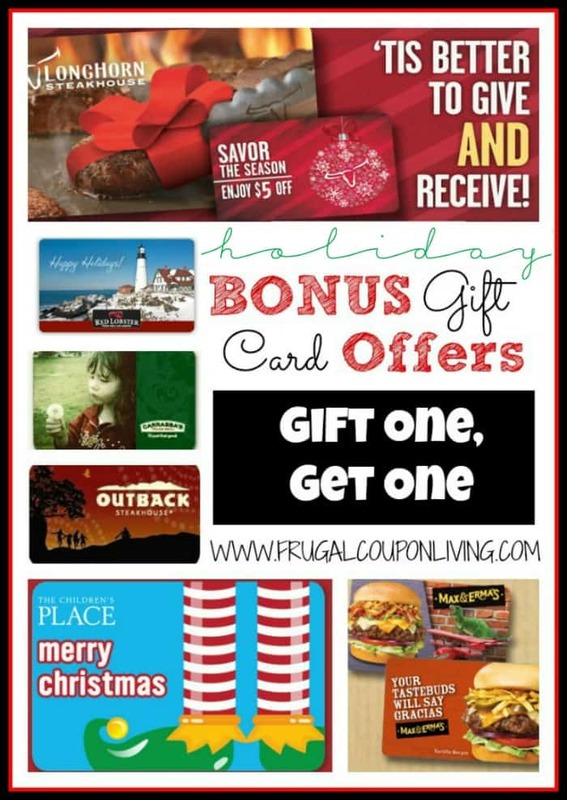 Find more Seasonal Deals and Christmas Deals on Frugal Coupon Living. Hey Veteran’s, there are many discounts (and possible FREEBIES) for you this weekend. Restaurants, businesses, and attractions are extending their thanks to veterans and active duty military personnel by offering deals and discounts on Veterans Day and throughout the weekend. Take a look at the following discounts below. Please call your local location ahead to confirm discount. Anthony’s Coal Fired Pizza: Active duty and former service members and veterans can receive a complimentary small order of meatballs with ricotta cheese Saturday, Nov. 11. The promotion is available for both dine-in and take out. Proper identification or uniforms are required. Applebee’s: Veterans and active duty service members can choose a free meal from a special menu Saturday, Nov. 11. Proof of military service is required. The offer is valid for dine-in only. Arooga’s Grille House & Sports Bar: Veterans get a free pretzel (Soft Pretzels and Fat Tire Beer Cheese, Crab Pretzel, or Buffalo Pretzel) Saturday, Nov. 11, all day at all locations (excluding Attleboro, Mass., and ending at 4 p.m. in Patchogue, N.Y.). Offer is valid for dine-in only, and proof of service is required. Back Yard Burgers: Back Yard Burgers is offering a free Classic Burger to veterans and service members in uniform or with a valid ID Saturday, Nov. 11. Bob Evans: Veterans and active duty military personnel can get a free breakfast, lunch, or dinner from a select menu Nov. 11 at all Bob Evans restaurants. Buffalo Wild Wings: Saturday, Nov. 11 active and retired armed services members can get a complimentary order of wings with a side of fries. Valid military ID is required. California Pizza Kitchen: On Saturday, Nov. 11, U.S. military members, both past and present, get a complimentary entrée from a special Veterans Day menu at all participating California Pizza Kitchen locations nationwide. Cattlemens Steakhouse: All active, inactive, and retired military personnel can enjoy a complimentary 8 oz. sirloin steak dinner Nov. 11. Chuck E. Cheese’s: Veterans can get one free personal pizza Nov. 11 at all U.S. restaurants. Valid military ID or proof of military service is required. 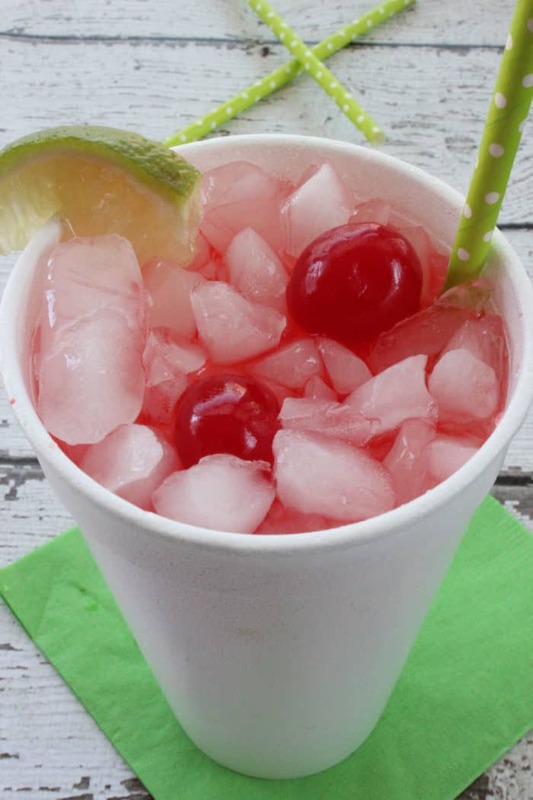 Circle K convenience stores: Veterans can receive a free Polar Pop on Nov. 11. Present the Veterans Day deal on the Circle K mobile app and show your military ID at any Circle K store. Cracker Barrel: On Nov. 11, Cracker Barrel will offer veterans a complimentary piece of Double Chocolate Fudge Coca-Cola® Cake for dessert at all 646 Cracker Barrel Old Country Store locations. Denny’s: On Friday, Nov. 10, participating locations nationwide will offer a complimentary Build Your Own Grand Slam® to servicemembers. The offer is valid from 5 a.m. to noon with a valid military ID. Dunkin’ Donuts: On Saturday, Nov. 11, anyone who shows a military ID at participating Dunkin’ Donuts restaurants nationwide will be offered a free donut of their choice with no purchase necessary, while supplies last. El Fenix: On Saturday, Nov. 11, all active duty and retired members of the U.S. military will receive a complimentary meal of their choice from a special menu. Proof of service is required, and the offer is valid for dine-in only. Famous Dave’s: All former and current military personnel get a free Two Meat Salute (served with choice of one side and a corn bread muffin) Saturday, Nov. 11. The offer is valid for dine-in only, and proof of service is required. Fazoli’s: All active, inactive, and retired military personnel get a free spaghetti with marinara or meat sauce — no purchase necessary with an ID or in uniform — from Friday, Nov. 10 through Sunday, Nov 12. In addition to the Veterans Day weekend offer, Fazoli’s is rolling out an ongoing year-round discount program for veterans by offering 10 percent off any purchase with a military ID or in uniform. 54th Street Grill & Bar: Veterans and active duty military personnel get a free lunch or dinner (any item on the menu, up to $12 value) Saturday, Nov. 11. This offer is valid at Dallas/Fort Worth, Kansas City, St. Louis, and San Antonio 54th Street locations. Proof of military service is required. Friendly’s: Veterans and active duty service members, with a valid military ID or honorable discharge card, get a free breakfast, lunch, or dinner on Veterans Day, Saturday, Nov. 11. The breakfast offer is for the Big-Two-Do® and includes a fresh cup of coffee. The lunch/dinner offer is for a complimentary All-American Burger with fries and a beverage (soda, iced tea, or hot beverage). The offer is valid at all Friendly’s locations for dine-in guests only and is limited to one breakfast or lunch/dinner entrée per person. Golden Corral: Veterans, military retirees, and active duty service members, including National Guard and Reserve members, can enjoy a free buffet Monday, Nov. 13 from 5-9 p.m.
Hickory Tavern: Veterans and active duty service members get 50-percent off food and non-alcoholic beverages from a special menu on Veterans Day. The offer is for dine-in only, cannot be combined with other offers, and will be available at Hickory Tavern locations across North Carolina, South Carolina, Alabama, and Tennessee. Military ID is required. IHOP: Friday, Nov. 10, participating restaurants will offer retired and active duty military members a free stack of three Red, White & Blue pancakes or a Red, White and Blue pancake combo (depending on franchised location offer) between 7 a.m. and 7 p.m. Proof of service is required. JJ’s Red Hots (Charlotte, N.C.): Service members and veterans get a free meal, including unlimited hot dogs, sausages, sides, and non-alcoholic drinks, all day on Veterans Day. The offer is valid for dine-in only. Krystal: From 6 a.m. to 11 a.m. Saturday, Nov. 11, all active duty and retired military personnel can receive a free sausage biscuit. Proof of service is required. Little Caesars: On Saturday, Nov. 11 from 11 a.m. to 2 p.m., veterans and active duty military members can receive their free $5 Lunch Combo, which features four slices of Little Caesars popular Detroit-style DEEP!DEEP!™ Dish pizza, paired with a 20-ounce Pepsi product. Proof of service is required. Mission BBQ: Veterans and active duty military members get a free sandwich and a slice of cake Nov. 11. McCormick & Schmick’s: Veterans and Gold Star honorees (parents and spouse) can receive a free entree from a special menu Sunday, Nov. 5 at participating restaurants. Veterans must show proof of military service. Reservations are highly recommended. O’Charley’s: On Nov. 11, all service members and veterans can enjoy meals on the house from the “$9.99er Menu” all day long simply by showing their military Ids. On the Border: Veterans and service members get a free create-your-own combo meal (choose two or choose three options) with rice and beans, plus chips and salsa Nov. 11. Military ID or proof of service is required. Outback Steakhouse: All military personnel that have military ID can get a free Bloomin’ Onion and beverage Nov. 11. Primanti Brothers: Veterans and active duty service members get one free Classic Primanti Bros. Sandwich, available all day, at participating locations. The offer is valid for dine-in only, and proof of service is required. Quaker Steak and Lube: On Nov. 11, veterans and currently serving military members can receive a complimentary or discounted meal by simply showing proof of service to their server prior to ordering their meal. Red Lobster: Veterans, active duty service members, and reservists get a free appetizer or dessert from a special menu Saturday, Nov. 11, 2017. Guests need to show a valid military ID or proof of service to redeem this offer. Red Robin Gourmet Burgers and Brews: On Saturday, Nov. 11, all veterans and active duty servicemembers can enjoy a free Red’s Tavern Double Burger served with Bottomless Steak Fries at participating restaurants nationwide. Rock & Brews: Veterans, active duty service members, and first responders can receive a complimentary meal Nov. 11 at participating restaurants with proof of service. Ruby’s Diner: All veterans and active duty members of the military are invited to enjoy a Ruby’s adult entrée on the house Saturday, Nov. 11, 2017 at participating locations. The complimentary meal options include a Two Eggs Combo Breakfast (available until 11:30 a.m.) or the Classic Ruby Burger (available open to close). Ruby Tuesday: Military personnel can get a free appetizer (up to $10 in menu value) Saturday, Nov. 11. Shari’s Café and Pies: Current and former service members can get a free pancake breakfast (which includes three pancakes, two eggs, two slices of bacon, and hash brown potatoes) on Veterans Day, Nov. 11 at all 94 Shari’s Café and Pies locations throughout Oregon, Washington, California, Idaho, Nebraska, and Wyoming. Shoney’s: Service members and veterans get a free all-you-care-to-eat breakfast Nov. 11 from 6-11 a.m. Proof of military service is required, the offer is valid for dine-in only, and beverage, tax, and gratuity are not included. Sizzler: Veterans and active duty service members get a free lunch Saturday, Nov. 11, until 4 p.m. Proof of military service is required. Guests can choose from a 6-ounce tri-tip sirloin steak, Malibu Chicken, or six jumbo crispy shrimp with a choice of side dish and beverage at participating locations. TA Restaurant Group (Country Pride and Iron Skillet): All active duty military members, veterans, and reservists with proof of service can enjoy a complimentary meal from a select menu that includes a beverage Nov. 11 at any participating Country Pride or Iron Skillet restaurant nationwide. Texas Roadhouse: Active duty, former, and retired service members will receive a free lunch from a special menu Saturday, Nov. 11. 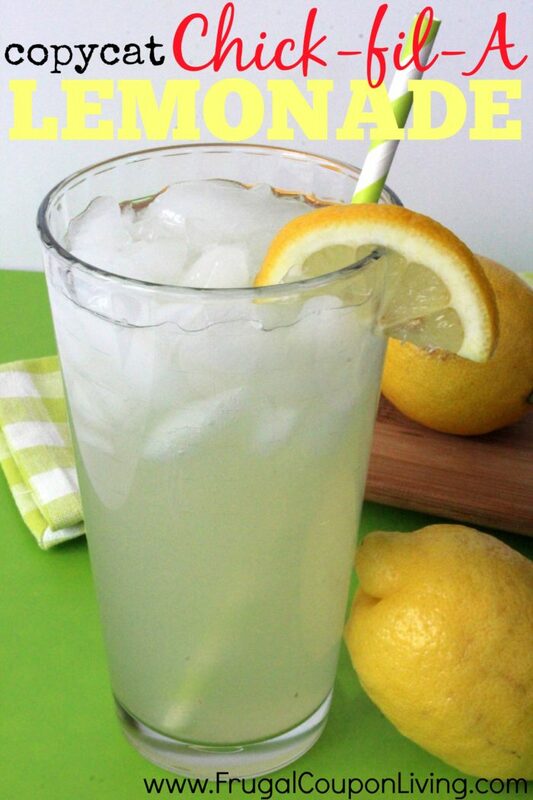 This is for dine-in only. Hours may vary by location, so check a Texas Roadhouse near you for specific details. Army & Air Force Exchange Service: From Nov. 10 -16, all authorized Exchange shoppers can enjoy military-exclusive savings on electronics, apparel, appliances, and more. Deals start at midnight Central Time on Nov. 10 at ShopMyExchange.com. Shoppers also can save in-person at their local Exchange during normal operating hours starting Nov. 10. Shoppers are encouraged to arrive early to ensure their place in line. Shoppers can get a sneak peek at sale items and pricing starting Nov. 3 by logging on toShopMyExchange.com, downloading the Exchange EXTRA app, or picking up the Veterans Day sale flyer at their local Exchange. Bed Bath and Beyond: Active duty service members, reserve members, and veterans and their spouses get 25 percent off their entire purchase in-store Thursday, Nov. 9 to Sunday, Nov. 12. Valid ID is required. Buy Buy Baby: Active duty service members, reserve members, and veterans and their spouses get 25 percent off their entire purchase in-store Thursday, Nov. 9 to Sunday, Nov. 12. Valid ID is required. Cabela’s: Nov. 9-12, Cabela’s will offer an additional 5-percent discount (on top of its year round Legendary Salute Military 5% Discount Program) to the military community. For additional details, visit www.cabelas.com/military. Dollar General: Veterans and active duty service members and their immediate family members get an 11-percent discount on qualifying purchases both in stores and online Saturday, Nov. 11. Flu shot: American Family Care (AFC) will offer military veterans free flu shots Saturday, Nov. 11. Visit AmericanFamilyCare.com to find your nearest AFC clinic. Great Clips: Great Clips will honor veterans and servicemembers with free haircuts on Veterans Day. Veterans who come to Great Clips Nov. 11 will receive either a free haircut that day or a free haircut card to redeem by Dec. 31. Publix: Veterans and active military personnel and their families can save 10 percent on groceries Nov. 11, 2017. Proof of service is required. QALO: QALO has created a one-of-a-kind functional wedding ring dedicated to members of the military. In addition, on Veterans Day, QALO is offering 15 percent off. Learn more at https://qalo.com/collections/us-military. Social Security Solutions: Veterans and servicemembers can get a free Social Security report that outlines how to claim retirement benefits in the most advantageous way online from 12 a.m. to 11:59 p.m. Nov. 11 at http://www.socialsecuritysolutions.com/veteransday. Southeastern Grocers (BI-LO, Fresco y Más, Harveys Supermarket, and Winn-Dixie stores): Active duty servicemembers and veterans can receive a 10-percent discount on qualifying grocery purchases Nov. 11. TOMS: Active duty servicemembers, National Guard and Reserve members, veterans, military retirees, dependents, and their spouses get 15 percent off all full-priced items until Nov. 15. Redeem the offer at TOMS.com/military-discount. Walgreens: On Saturday, Nov. 11, customers with a Walgreens Balance® Rewards card and valid military ID or proof of service will receive 20 percent off regular price eligible store items at any Walgreens or Duane Reade drugstore nationwide. A Balance® Rewards customer loyalty program membership is free and can be obtained at checkout. Family members of veterans and military personnel also are eligible for the discount. Aquarium of the Pacific (Long Beach, Calif.): Veterans and active duty military personnel who show valid service ID receive free admission Nov. 11. B&Bs for Vets: For the 10th year, B&Bs for Vets is providing complimentary rooms to retired veterans and active duty military members Nov. 9, 10, or 11, 2017. (The dates vary from inn to inn according to the innkeeper’s choice.) Many inns and B&Bs dedicate the whole property to free rooms for veterans; others extend the offer with discounts throughout the month. Des Moines Botanical Center (Des Moines, Iowa): Veterans receive free admission to the Des Moines Botanical Center Saturday, Nov. 11. Harley-Davidson Museum (Milwaukee): Nov. 10-12 from 10 a.m.-6 p.m, the Harley-Davidson Museum will offer free museum entry for all active duty service members and veterans and their families. Main Event Bowling: Active duty service members and veterans get a free entree and a $10 FUNcard Saturday, Nov. 11 from open to 5 p.m.
Mount Vernon (Mount Vernon, Va.): All active duty, former, or retired military personnel receive free admission on Veterans Day. National World War I Museum and Memorial (Kansas City, Mo. ): During Veterans Day weekend (Friday, Nov. 10 to Sunday, Nov. 12), veterans and active duty military personnel receive free admission, while the general public receives half-price admission. The museum also will host a free public ceremony at 10 a.m. Nov. 11. New Mexico Museum of Space History (Alamogordo, N.M.): Veterans receive free admission to the museum all day Nov. 11. Newseum (Washington, D.C.): Service members and veterans, plus one guest, get free admission Friday, Nov. 10 through Sunday, Nov. 12. To take advantage of this offer, service members should present military ID or another form of military service credential or wear their uniforms. 9/11 Memorial & Museum (New York City): From Wednesday, Nov. 8 to Sunday, Nov.12, the 9/11 Memorial & Museum will host a series of events and special programs for veterans and their families, as well as the visiting public. Throughout the tribute, veterans will receive free museum admission. Veterans also will receive half-price museum tickets for two family members during the tribute. Ticketing for Salute to Service will be available at a dedicated ticket table at the museum entrance. Point Defiance Zoo and Aquarium (Tacoma, Wash.): Currently serving military personnel and veterans are admitted for free Nov. 10, 11, and 12. Immediate family members will receive half-off general admission. Proof of military service is required. Riverbanks Zoo (Columbia, S.C.): Active duty and retired service members with a military ID card receive free admission in honor of Veterans Day. Westgate Resorts: Beginning Nov. 10 at 9 a.m. EST, the first 1,500 eligible servicemembers to complete the online military appreciation form at www.westgateresorts.com/thankyoumilitary and place a fully refundable $100 deposit can sign up for either one of 1,400 complimentary four-day, three-night vacations for up to four people at Westgate Town Center Resort & Spa, May 3-6, 2018, or one of 100 three-day, two-night vacations for up to two people at Westgate Las Vegas Resort & Casino, Dec. 8-10, 2017. The 1,500 free vacations are for current active duty military personnel who have served in combat and their families, as well as Gold Star families. In addition, Westgate Resorts will offer a special 25-percent savings for rooms across their entire portfolio of 27 resort destinations for all U.S. military veterans valid for travel by Nov. 10, 2018. For more information, visit www.westgateresorts.com/thankyoumilitary/. World of Coca-Cola (Atlanta): Now through Nov. 12, active duty, reserve, and retired members of the U.S. armed forces may purchase up to four general admission tickets at 50 percent off for their friends and family. Tickets may be purchased at the attraction’s ticketing windows when members present their valid U.S. military ID. Thank you for your service! 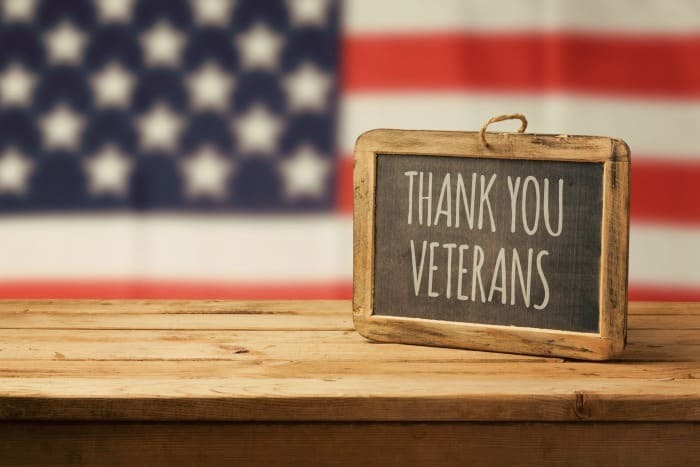 Enjoy these Veteran’s Day Discounts! 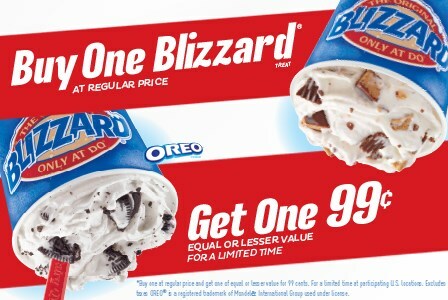 Dairy Queen: Buy One Get One for $0.99 Blizzards! Starting today and through 9/3, stop by Dairy Queen and get a Blizzard for $0.99 when you buy another one at regular price. 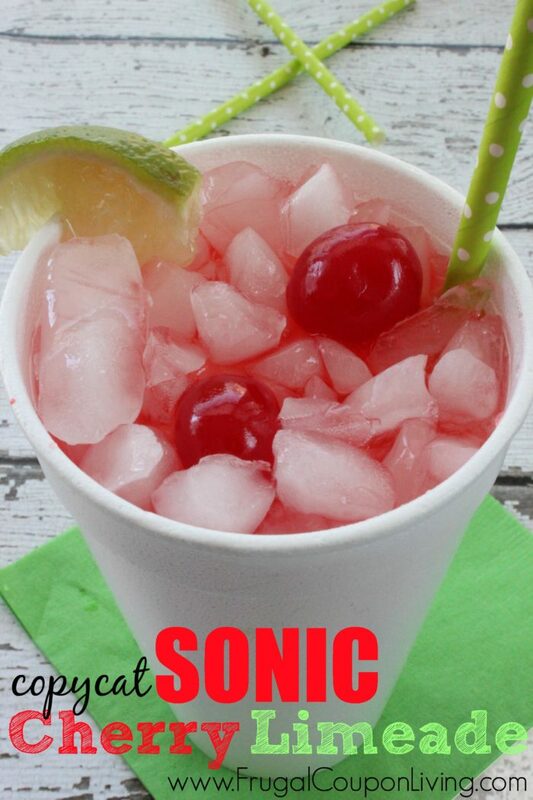 Great time to take a friend or kids to enjoy this yummy treat. Find the DQ closes to you here. You really want to try making this delicious Orange Julius Copycat recipe. Denny’s: All You Can Eat Mooncakes Just $4! Denny’s is celebrating the upcoming Solar Eclipse with delicious, moon-shaped Buttermilk Pancakes. For one day only, get all you can eat “Mooncakes” for just $4! 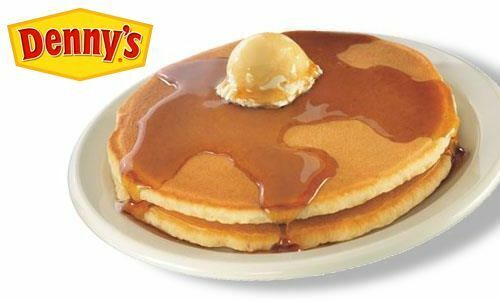 To find your nearest Denny’s location, visit www.dennys.com. 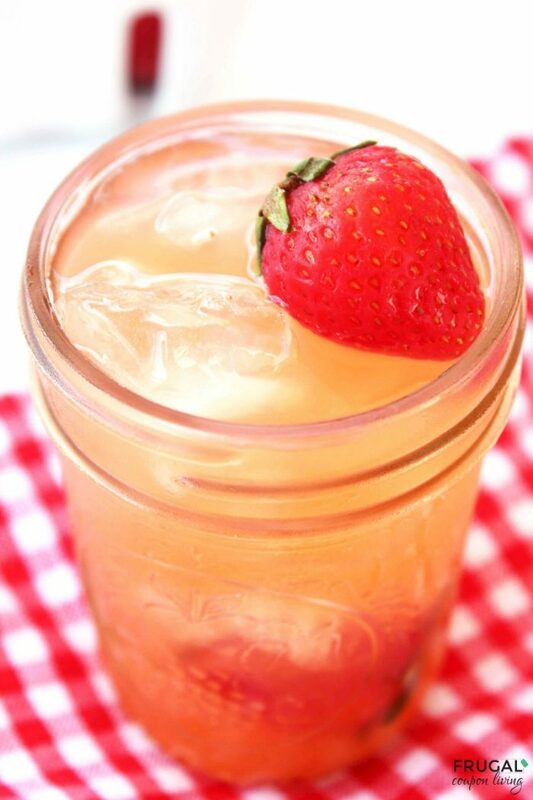 Find more Restaurant Deals on Frugal Coupon Living.